Boynton Beach has numerous outdoor parks and open spaces for people of all ages and abilities to play and grow in nature. Explore them below (broken down by category). Park Hours: Sunrise –9:00 p.m. Historical Information: The City acquired the property in 2001. The undeveloped property was referred to as Southeast Neighborhood Park. The developers of an apartment/condo complex (Villa Del Sol) that borders the property on Federal Highway were required to give land or pay a fee in lieu of land. Since the project was multi-family zoned, the amount of land they were going to have to dedicate was significant, which had the developers concerned about the costs. When the original Recreation and Open Space Element of the Comprehensive Master Plan was developed in the early 1980's, the City had been aware that there was a need for a neighborhood park in the southeast section of the City, and began looking for properties that would be suitable for a park. A local resident, Walter Zill, owned 5 acres that was a mango nursery/orchard adjacent to the property where the developers were building the apartments/condos. This property was deemed to be in the right area to develop a park and the City contacted the developer to purchase part of the nursery property for the City to meet the requirements of land dedication. The fees that the developer would have had to pay were higher than the cost of the Zill property. Therefore, the land was purchased and donated to the City in lieu of the fee. The grand opening celebration for the park, named for longtime resident and former Recreation & Parks Advisory Board Chair, Betty Thomas, was held on March 24, 2007. Amenities: Benches, bike rack, bocce court, fitness trail (1/2-mile path with 12-exercise stations), gazebo, open play area, playground. Dogs on leashes allowed. Historical Information: Boynton Lakes Park is located in the Boynton Lakes neighborhood. The master plan was completed in 1992. The land was acquired through land dedication from the developer. Historical Information: Forest Hills Park is part of the Rolling Green Ridge and is named after the Forest Hill subdivision. It was built from property that was left over when I-95 was built in the 1970's. The property was given to the City from the Department of Transportation. A former City Deputy Engineer and a former Recreation and Parks Director designed the park in-house. The park, on the grounds of Galaxy Elementary School, is under construction, along with the school which is being rebuilt. Historical Information: This small park was built in 1973 with land donated to the city by the developer of the Lake Boynton Estates neighborhood. Historical Information: Previously known as the Nautica Park site, located on the northwest corner of Lawrence Road and Nautica Boulevard, this property was given to the City as part of the Park & Recreation dedication requirement. Constructed by D.R. Horton as part of the Knollwood Development, the park provides a passive park with a pond plus littoral zone plantings to attract wildlife and various environmental interpretative features. Historical Information: The park is located in the Laurel Hills Neighborhood, and was built in the mid-1970's. The land was previously platted for residential development and for one reason or another, didn't sell. A former City Deputy Engineer and a former Recreation and Parks Director designed the park in-house. In the mid-1970's, the City had a program called CETA (Comprehensive Employee Training Act). The federal government hired people and "loaned" them to municipalities with the intention that when positions became available, they would be hired full time with the City. This park was developed through this program. Park Hours: Sunrise – Sunset; lighted facilities open until 10:00 p.m. Historical Information: During master planning for this park, located adjacent to the Meadows community, there were recreation and park professionals present during the planning who lived in the neighborhoods who all agreed that active recreation was needed in the new park. Now the well-utilized park is an ideal neighborhood park. Historical Information: Mr. Pence, a real estate developer, originally owned the property. The property was used as a recreation area long before the ball field was built (in the mid 1950's). The basketball courts were rebuilt in the late 1980's and lights were added to increase use. In 2009, the softball field was converted to a multi-purpose field to accommodate the community's need for open space for soccer. The fields are lighted to allow for night play. In 2011 the basketball courts were renovated by adding a sport surfacing to the previously concrete courts. Historical Information: Located on the C-16 canal that runs east to west, the park provides boaters fresh water access to the E-4 canal that runs north to south and access to Lake Osborne to the north and Lake Ida to the south. The South Florida Water Management District is responsible for dredging the canal. Park Hours: Sunrise – Sunset; lighted facilities open until 9:00 p.m. Amenities: At the park: fitness trail, pavilion, picnic tables with umbrellas, benches, drinking fountain, open play area, specialty play structures for different age groups and all abilities, spray-ground, accessible restrooms/family restroom. At the Tennis Center: 17 Har Tru and 4 composite tennis courts, restrooms with shower, drinking fountains, canopied areas with picnic tables. This is the location of the City's barrier free playground, park and Tennis Center. Three separate sections of land were acquired over a period of time and the City eventually had 30 acres of property. The property was given to the City before 1979, prior to there being any requirements for land dedication from developers. Five acres were given to WXEL as the public television station grew. The Tennis Center was built in three phases. There are 17 Har-Tru and four composite courts. Adjacent to the tennis courts and the Pro Shop are canopy areas with tables and chairs. The west side of the property backs up to a lake and in the center of the property is a small pond. There are wetlands on the property planted with native vegetation. Realizing the need for a barrier-free park in Palm Beach County where over 187,000 disabled residents reside, in 2005 representatives of agencies that offer services for special needs individuals, including the United Way, United Cerebral Palsy, Lions Club, American Red Cross, The ARC and Deaf Service Center were invited to participate in a design charette to determine the elements needed in a “barrier-free” park. The design charette helped to create the master plan for this very unique and special park. Construction of the first phase of the 13.5 acre Congress Avenue Barrier Free Park began in 2010. The park is designed to accommodate people of all ages and abilities on an equal level. The park is themed around a Florida Swamp. The central public space was designed to allow access to three play areas, two of which have been constructed, and the third will be constructed during a future phase of development. One is a free formed play structure that resembles a spider. It emulates the insect critters of the swamp. The other is a fish camp theme. The two ponds on the park are connected through a metaphorical “stream bed” that allows children and adults to climb through and experience rocks, spray misters, water and nature. Trails meander through the park leading to the different play and sensory experiences. Other park features include restored wetlands, picnic areas, and restrooms. Ultimately, the purpose of the park is to create an exciting, inspiring and accessible passive park and playground for adults and children of all ages and abilities to enjoy. Historical Information: The facility and park opened in 1992. Various phases of development and expansion have occurred since. The center is named after former Vice-Mayor Ezell Hester, Jr.
Half or more of the 23-acre site the park and recreation center sits on was once one of the largest remainders of native Florida scrub land in Palm Beach County (in 1988). As a part of the construction, scrub preserve fencing was placed around the Rolling Green Scrub. The property was owned by a developer who was developing property on Congress Avenue. The developer was not interested in developing the property so to satisfy land dedication requirements the land was given to the City. Rolling Green Park (not to be confused with Rolling Green Elementary School) was the original park name before the community center was built. In planning the park, the City was required to preserve about 25% of the total acreage as scrub land (Rolling Green Scrub). The press box was built adjacent to the football field in 2003 and is dedicated to former Recreation and Parks Department employee Tom Williams. A new playground was built in 2006. In the summer of 2009 the football field was dedicated to longtime PAL (Police Athletic League) officer Bill Tome. Park Hours: Sunrise – 9:00 p.m. Historical Information: The original facility was built in 1961. Mr. Wilson, an advocate for recreation and parks, went to the City Commission with a request to build a center and pool in the northeast neighborhood of Boynton Beach. The ball field hosted the Boynton Beach Red Sox. In spite of the fact that the field was undersized, it was used often until the early 1990's. In 1982, Palm Beach County contributed $32,274 for Wilson Park improvements, which included adding a basketball court, additional fencing around the ball fields, and security lighting. In 2003, county voters approved a $50M Recreation and Cultural Facilities Bond and Palm Beach County designated $1,000,000 for renovation of the Wilson Park area. The project included the construction of a new center, renovations and improvements to the community pool, basketball courts, a multi-purpose field and a playground with updated play equipment. The Grand Opening of the Carolyn Sims Community Center and John Denson Pool at Wilson Park was held on February 9, 2008, with a special sky jump by the US Special Ops Command Parachute Team. Beach and Boat decals: During our busiest season (January - May), the parking lot may fill up. Resident decals do not guarantee that parking spaces are always available. Need a decal? Click here. Lifeguards are on duty 7-days a week 9:00 a.m. – 5:00 p.m.; Parking attendants are on duty 7-days a week 8:00 a.m. – 4:00 p.m.
Sea turtle nesting season is April 1 – October 31. Sea Turtles are an endangered or threatened species, during this time of year keep lights from shining onto the beach. Security or safety lights near the beach must have shades built around the light so the beach is not directly illuminated. Bright lights will disorient hatchlings. DISTURBING A SEA TURTLE NEST IS A VIOLATION OF STATE AND FEDERAL LAWS. Special Accommodations: Beach wheelchairs are available for public use. Anyone with a disability is asked to contact the lifeguards prior to going into the water. Concessions: The Sand Dollar Cafe offers sandwiches, salads, snacks, ice cream, and a variety of drinks at affordable prices. Rental of beach chairs, umbrellas, and beach toys is also available. Historical Information: In 1921 there existed a municipality know as the Town of Boynton which comprised the lands now contained within the boundaries of the two municipalities now know as the City of Boynton Beach and the Town of Ocean Ridge. In 1921, the Unified Town of Boynton acquired by eminent domain for park and recreation purposes from Lewis S. Howe what is now known as Boynton Beach Oceanfront Park. Boynton Beach Oceanfront Park was close to the hotel that was built by Major Boynton in the 1920's. The beach casino was built in 1928, which featured a large dining hall, locker rooms and showers and was used for parties and social gatherings. The casino was torn down in 1967 and the property later became the beach park. In 1966 by Resolution, the City Commission approved the municipal beach facility to be known as Walter A. Madsen Park, in appreciation of former Mayor, Vice-Mayor and City Councilman Walter A. Madsen. From the 1920's to today, Boynton Beach Oceanfront Park has been popular with residents and visitors alike. Many renovations have occurred over the years. In the 1970's there were only restrooms and a changing room. In 1983, the dune area was restored, a boardwalk was built, the restrooms and concessions were rebuilt and the parking lot as it is today was rebuilt. In the mid-1990's the park underwent a major renovation during which the boardwalk was rebuilt out of recycled plastic. In 2011 the boardwalk was renovated again, replacing the plastic with Ipe (pronounced ee-pay) wood (commonly known as Brazilian Walnut). In 2012 improvements were made to the buildings along the boardwalk, including total refurbishment of the restrooms. The beach was voted the best family beach in Palm Beach County by The Palm Beach Post in 2001. Manatees have been known to frequent the area. Boaters should use extra care when launching watercraft and when shifting out of neutral. Call 1-888-404-3922, or *FMP on your cell phone, or use VHF Channel 16 to report an injured manatee. A trailer parking/boat launching fee is required on weekends and city designated holidays ($10 per day), regardless of residency. The public can purchase a decal for $50 per year per decal. Decals are valid October 1 – September 30 (per Code of Ordinances Sec. 16-61). Decals can be purchased at City Hall or Intracoastal Park Clubhouse. Overnight boat docking is prohibited (per Code of Ordinances Sec. 16-59). Historical Information: Originally owned by the Boynton Beach Boat Club (a non-profit) in the 1950’s, the park had one ramp for local boaters. The club donated the building and a small portion of the land to the City. The City acquired additional properties and developed the park in cooperation with the FL Dept of Natural Resources through the Florida Recreation Development Assistance Program in 1986 with a grant of $212,000. The renovation cost approximately $600,000 and included rebuilding the boat launching ramps, building restrooms and picnic shelters, improving the sprinkler system, renovating the Boat Club building and construction of the 310 ft. fishing pier. In 1995, the City received $12,000 in grant funding from Palm Beach County through the Florida Boating Improvement Program for repair and replacement of the existing boat launching floating docks. The City again redeveloped the park (prior to opening Intracoastal Park) in 2001-02, adding much needed additional parking, ramps and holding docks with money from Palm Beach County Board of Commissioners. Palm Beach County contributed $900,000 towards the 2002 renovations, which included the seawall, boat ramps, 75 additional boat trailer parking spaces, new holding docks, addition of a “quiet pavilion” (next to the building), new playground and landscaping. In 2005, the clubhouse’s restrooms and kitchen were renovated and updated. At the same time, the fishing pier was renovated and refurbished. In 2010, more renovations were made to the park. Demolition of the restroom facilities made way for new restrooms. The older shelters were demolished and new, sailcloth roofed shelters were added. The renovations were funded with money granted from the Palm Beach County Board of Commissioners in the amount of $380,000. The Recreation and Parks Department and the Art in Public Places combined efforts to include public art projects in the park and in the spring of 2011 hosted the unveiling of the public art projects, park improvements and the Florida Fishing Academy headquarters. An unveiling event took place on April 16, 2011. This official public event featured the artwork of Guy Snell and Peter Agardy, speeches by local dignitaries, various youth activities and an appearance by former Massachusetts governor and former presidential candidate, Michael Dukakis. Peter Agardy, an accomplished graffiti and public artist, was selected by the Art in Public Places Program to create artwork that expresses the Boat Club Park’s character, proximity to the Boynton Beach Inlet, the City’s tag line, “Gateway to the Gulfstream,” historical connection to Boynton’s fishing community and nautical lifestyle. The mural on the retaining wall that greets you as you drive towards the boat ramps depicts the ocean and its importance and relationship to our community. The second featured mural near the roundabout heading toward the boat ramps, "Ode to Boynton," pays homage to the history of the fishing industry in Boynton Beach and present conservation efforts focusing on tag and release sailfish practices. Staffed on weekends and holidays, the 704-s.f. building at the entrance to the park was built in 1986. The building was originally used as a bait and tackle shop until the late 1990’s. In 2010, the Department donated the use of it as classroom space and headquarters for the Florida Fishing Academy. In return, the FFA spruced the old building. Volunteers and donors have turned that “beautification” project into a work of art. The work began in October with up-and-coming 15-year-old artist Guy Snell, an apprentice of world-renowned marine artist Wyland. Guy painted his depiction of Boynton’s unique marine environment on all four walls of the building. His expenses were paid by the Guy Harvey Ocean Foundation. In the fall of 2011 the park was officially renamed after pillar of the community and longtime resident Harvey E. Oyer, Jr. who passed away in December 2010. The boat ramps are within a 1.4-acre rock jetty basin that provides protection from wave action and is located directly across from the Boynton Inlet (to the Atlantic Ocean). In conjunction with Palm Beach County, the City coordinates the dredging of the Boynton Boat Club Navigation Access Channel of the Intracoastal Waterway, which is done every few years. A unique feature of this park is access for non-motorized vessel launching; swimming is not permitted in the pond or in the Intracoastal Waterway. A Veterans Memorial is located at the entrance to the park. A 1/3-mile concrete path winds around a small lake with a floating fountain. The wreckage of Lofthus, a 223-foot Norwegian shipping vessel that sank off the coast of Boynton Beach in 1898 while en route from Pensacola to Buenos Aires with a cargo of lumber. It was Palm Beach County's first officially designated underwater archaeological preserve which protects it from destruction and salvage. The ship's deck beams, mast, bow and hull have created a marine sanctuary for a variety of tropical fish, stingrays, anemones and spiny lobsters, and are considered a significant local dive spot. The Lofthus was built and launched in England in 1868 and was first used in the East Indian trade. It was later purchased by a Norwegian for use in transferring lumber throughout the Americas, before eventually being blown off course by a storm and wrecking off the coast of Boynton Beach. The wreckage now rests in 15-20 feet of water. The Lofthus shipwreck is the state's eighth underwater archeological preserve. BBQ grills, beach, benches, non-motorized vessel access, drinking fountain, meeting space, monofilament recycling bins, nature preserve (mitigation area), pavilions, picnic tables, playground, recreation building, rental shelters, restrooms, Intracoastal Waterway. Dogs on leashes allowed. The property was purchased in 1988 through a bond issue. At the time, the City Commission was supportive and a general bond referendum was passed by the voters. The park was master planned first in the early 1990's. The money became available for building the park when Palm Beach County approached the City with a desire to increase boating opportunities for local residents. The City redeveloped Boat Club Park (added additional boat trailer parking, holding docks) and was able to develop Intracoastal Park. The park's grand opening celebration was October 17, 2003. There is a pond in the park's center that was slated to be a dry retention area. It was decided that a pond would serve the purpose better and be more attractive to visitors. The Utilities Department installed a hydro-guard water-flushing device adjacent to the fresh water pond the flushes clean water into the pond that is used to pump out the water to irrigate the grass areas at no cost to the City. When the park was built, the existing mangrove and native coastal planting areas in the southeast corner of the property were preserved. It is a mitigation area (protected mangroves) with a conservation easement with the Florida Department of Environmental Protection. The Clubhouse at Intracoastal Park opened in September 2007. The two-story building features classrooms, catering kitchens, elevator, rental space, and a 10-foot wrap-around balcony overlooking the beautiful Intracoastal Waterway. Access to the Intracoastal Waterway is accessible for fishing. The eastern edge of the park consists of a mangrove mitigation area. Manatees have been known to frequent the area. Call 1-888-404-3922, or *FMP on your cell phone, or use VHF Channel 16 to report an injured manatee. Amenities: Benches, bike rack, bocce courts, non-motorized vessel access, drinking fountain, monofilament recycling bin, nature preserve (mitigation area), open play area, pavilions, picnic tables, playground, rental shelters, restrooms, fitness trail, Intracoastal Waterway. Dogs on leashes allowed. Historical Information: The City began leasing the property in 1965 from the Florida Inland Navigation District (F.I.N.D.) for $1 per year. The Recreation and Parks Department has fully maintained it since. F.I.N.D. 's purpose for the property was to be available to place dredge materials after dredging the Intracoastal Waterway. The original park was planned by the first Jaycee group in the mid 1970's who cleared the land and installed some irrigation with the assistance of City staff. Back then the property contained mango, lime, tangelo, avocado, loquat, banana and ficus trees. In 1988, a vehicle pathway was created along the northern property line that extends to the Intracoastal Waterway. The Florida Inland Navigation District (F.I.N.D.) put the property on the Lands Available List in 2003. Both the City and County were interested in preserving the land and worked together to purchase it in 2004. The City received funding from the County's 2002 Recreation and Cultural Facilities Bond and through a grant award from the Florida Communities Trust. In October 2007, the City began Phase I of the renovation project, with funding help from the Florida Recreation Development Assistant Program (FRDAP). Improvements, completed in March 2008, included a paved access road, an 18-space parking lot, three picnic shelters, a playground, paved sidewalk, an open play field, restrooms, and lush landscaping. Phase II, completed in 2010, included cultural education markers, art, fishing/day dockage pier and canoe/kayak launch. The rededication was held on April 10, 2008 and the public art ribbon cutting ceremony was held in March 2011. The park is located to the east of to St. Mark's Catholic Church and school in a mangrove hammock area adjacent to the Intracoastal Waterway. The park is connected by at least three tidal inlets along the western boarder. It is a great place to see a variety of animals, including birds, raccoons and manatees. Historical Information: Located on environmentally sensitive land, consisting of a mangrove at the east end of NE 4 Avenue, east of Federal Highway, the City leases the property from the Diocese of Palm Beach County. In 1997, the aluminum boardwalk, six interpretative panels, lighted restrooms, lighted parking lot, gates and landscaping were installed. The funding was cooperation between the City, Palm Beach County, Florida Inland Navigation District, Department of Environmental Protection, Florida Recreation Development Assistance Program (FRDAP), St. Mark's Parish, The Diocese of Palm Beach, the Solid Waste Authority, and Florida Coastal Management Program. The park is used by schoolchildren and environmental/conservation groups for educational aspects. This park provides a fun and educational experience, which preserves the environment and exhibits the natural beauty of our area. Historical Information: In January 1995, Palm Beach County bought 5 acres of the natural area from Resolution Trust Corporation. In March 1995, the County purchased an additional 8 acres from Janmar Properties, Ltd. The State of Florida provided Preservation 2000 matching funds for these acquisitions through the Florida Communities Trust. This natural area is managed as part of a countywide system of natural areas protected to maintain the diversity of biological communities and species found in Palm Beach County. Rosemary Scrub is open to the public for environmental education, scientific research, and passive recreational activities such as bird watching, nature walks, and photography. Rosemary Scrub is one of the few remaining examples of the Florida Scrub ecosystem left in Palm Beach County. The site contains sand pine scrub, scrubby pine flatwoods and mesic hammock communities. Less than 2% of the historic scrub ecosystem still exists in the County, making preservation of this endangered natural community extremely important. Rosemary Scrub does not contain many animals because of its small size and urban location. The site does protect a small population of gopher tortoises, and serves as a sanctuary for migratory birds. It will be managed to create favorable conditions for the return of listed species such as the Florida scrub jay. Other animals present on the site include the green anole and six-lined racerunner. Various rare plants recorded on the site include the endangered Curtiss' milkweed, large-flowered rosemary, nodding pinweed and erect prickly pear. Other plants found on the site include the giant air plant, coast plain staggerbush, deer moss, netted pawpaw and several species of native bromeliads. Historical Information: The site was purchased in 1994 with funding from Palm Beach County and the City of Boynton. State Preservation 2000 matching funds were provided by the Florida Communities Trust. The property is maintained jointly with Palm Beach County and the Recreation and Parks Department. The natural area is managed as part of a countywide system of natural areas, protected to maintain the diversity of biological communities and species in Palm Beach County. The natural area is open to the public for environmental education, scientific research, and passive recreation activities such as photography, bird watching, and nature walks. Many of the species of plants recorded for this natural area are endemic to the Florida scrub ecosystem. Endangered or threatened plant species on the site include large-flowered rosemary, nodding pinweed, pine pinweed, Curtiss' milkweed, twisted and banded air plant and giant wild pine. The site also contains other unusual plant species including scrub palmetto, sand spike moss and silk grass. Many species of animals inhabit the Seacrest Natural area scrub including the gopher tortoise, a species of special concern in Florida. Other species known to reside on the site include painted lady butterfly, golden silk spider, prairie warbler, great horned owl, red-bellied woodpecker, ring neck snake and common gray fox. The scrub contains Florida scrub and scrubby pine flatwoods communities and is one of the largest remaining scrub sites in southern Palm Beach County. Florida scrub occurs on sandy ridges along ancient shorelines, and exists on well-drained sandy coastal ridge soils. They act as recharge areas for underground drinking water aquifers and may limit saltwater intrusion into these aquifers. Scrub is a dry ecosystem regulated by fire and composed primarily of sand pines, saw palmettos, dwarf oaks, lichens and barren patches of sand. Many of these plants have developed water-conserving strategies such as thick, wax-coated leaves to survive in the harsh conditions of this environment. Except for a few small areas in neighboring states, Florida scrub is a plant community unique to Florida. It is an important part of Palm Beach County's natural heritage. For information about the scrub, please call (561) 963-6737. (information courtesy of Palm Beach County). Historical Information: The land was leased from the Florida Department of Transportation by the City starting in 1978. This property was originally aBarton Memorial Park North entrance stone dsc legitimate City dump and next to it was an informal cemetery used primarily by the African American community who lived in the area. On the property are gravesites dating back to the early 1900's. The site contains 20 marked graves and an undetermined number of unmarked graves. It wasn't known that there was a cemetery on the site until Mr. Alton Barton identified the plots to DOT, as his son was buried in the area. The cemetery portion of the park makes up about 1/2-acre. The park is named after Alton Barton, who was born in 1944 and was put to rest in 1950. The Barton family still lives in the area and was instrumental in preserving the cemetery when I-95 was constructed through Boynton Beach in the 1970's. The interstate was originally planned to pass through the cemetery; however, recent research and a Ground Penetrating Radar survey suggest I-95 was realigned and many of the burials remain in place. The property is now closed to burials. Burials are coordinated through the City Clerk's Office. Contact 561-742-6060. Historical Information: Boynton Memorial Park was not originally owned by the city, but was a vacant piece of land where people were burying their family members. The property was acquired in the 1950's, from the developer of High Point. In the earlier (eastern) sections of the cemetery, the gravestones are all standing upright. In the latter (western) sections, the headstones are all ground level so that maintenance is safer and more efficient. There are some unmarked graves that go back to the early part of the last century. There are no records from before the time the City acquired the property, except by reviewing the existing gravestones. The newer sections of the cemetery are all platted and plots are sold via the City Clerk's Office. A portion of the money goes to the Perpetual Care Fund to maintain the park. There is a children's section of the park with a standing monument in the middle that represents all the children in that section. The statue was designed by artist Conrad Pickel, who had a studio in town. In 1981 the mausoleum opened. The Hurford Chapel is named after a former Cemetery Board member. Record keeping is handled by the City Clerk's Office. The Parks Division is responsible for all normal grounds maintenance as well as grave opening and closings and mausoleum entombments. NOTE-Officer Joseph Crowder Dog Park is currently closed for expansion, and will reopen soon. Historical Information: Kids Kingdom Playground is located between City Hall and the Civic Center adjacent to the 1913 Schoolhouse Children's Museum. The 20,000 square foot multi-level play area, made of wood and recycled plastic, was a community built project with over 1,800 volunteers participating from start to completion. The project was spearheaded by local activist, Mike Fitzpatrick, through the Recreation and Parks Board. The School District of Palm Beach County originally owned the property. When the School Board vacated the old high school (used after 1949 as an elementary school until it, too, was vacated in the early 1990's), the property and the buildings were given to the City. The project took two years to complete, and the park opened in April 1996. Minor renovations and repairs were done in late 1999 after a fire. In 2011 the Community Redevelopment Agency (CRA) renovated the amphitheater to improve open space for events and performances in the downtown area. Historical Information: Home of the East Boynton Little League, the current Little League area was future cemetery land for the expansion of Boynton Memorial Park. The property was acquired in the 1950's from the developer of High Point. The cemetery development began before Little League Park. Prior to that time, Little League games were located at Galaxy Park (built in the late 1950's) which had only one field that was a 60' base field, serving kids up to 12 years of age. When Little League included a senior league program (up to 16 years of age), they needed a full size (90') baseball field. It was decided that both fields would be moved to the current Little League Park location on Woolbright Road. In 2006, producers of ABC's Extreme Makeover: Home Edition heard about the park through applications to the show from people in the community. This was three months after damage occurred due to Hurricane Wilma in October 2005. It was the community spirit ABC saw in an audition that weighed heavily in the City's favor, producers said. The Boynton project, part of the show's After the Storm series on hurricane-damaged communities aired in the Spring of 2006. The producers of the popular home-remodeling television show came to town to "make over" the damaged facility. ABC renovated the northeast fields where the younger children play. The City Commission agreed to spend $143,000 to renovate the northwest fields, where the older children play. The makeover included new irrigation, fencing, batting cages, replacing light poles, bleachers, grass and sod and new park sign. The show's crews also repaired the roof and interior of the concession stand. The park is home of the 2003 Little League National Champions, the East Boynton Beach Little League. Historical Information: The park is adjacent to Sara Sims Memorial Cemetery. The Sara Sims Park and Sara Sims Cemetery property were originally purchased in conjunction with Palm Beach County Division of Housing and Community Development Division through their Community Development Block Grant (CDBG) fund. The first phase of development took place in 1979. In 1987, the Palm Beach County Division of Housing and Community Development transferred two vacant buildings on the south side of NW 10 Avenue to the City to incorporate as part of the park. Part of the as-yet developed park at Sara Sims was designated as a cemetery in the early 1970's and plotted due to the necessity of relocating graves at Barton Memorial Park. There is still availability for gravesites at Sara Sims Cemetery and the thought is that this cemetery will become more popular when Boynton Memorial Park is no longer an option for burials. When the park was planned, the neighborhood decided that the active areas should be away from houses and located on the east side of the park and the passive areas should be located on the west side of the park. The Recreation and Parks Department worked with the neighbors to ensure their desires were met. The park was improved and expanded in 1989 including landscaping and irrigation improvements, new fencing, racquetball courts, a drinking fountain, a pedestrian path, basketball courts, and lighting. In 1993, Palm Beach County contributed funding through the Community Development Block Grant towards street improvements and park improvements with a portion of it used towards the addition of two lighted racquetball courts and additional playground equipment. These improvements were made in 1994. A Graffiti Mural Project was completed in early December 2009. This project included an educational and community component. Graffiti Art is a unique form of art and is very appealing to community youth, providing a great way for them to positively express themselves. The Graffiti Mural Project was funded by the Youth Violence Prevention Program through the Palm Beach County Criminal Justice Commission. It taught youth the positive aspects of "Graffiti Art" as opposed to negative and illegal "tagging." Social investment is key to the Heart of Boynton redevelopment efforts. The project created a series of community events called "painting sessions" that began on September 26, 2009 and continued through October 29, 2009. 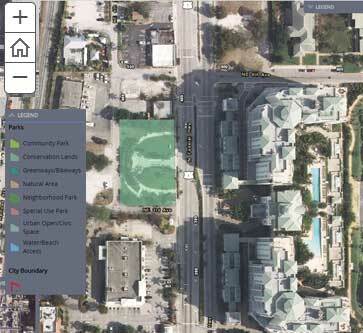 In the future, the park will be redeveloped and the basketball courts moved when the Heart of Boynton (redevelopment and new housing) plan goes into effect.